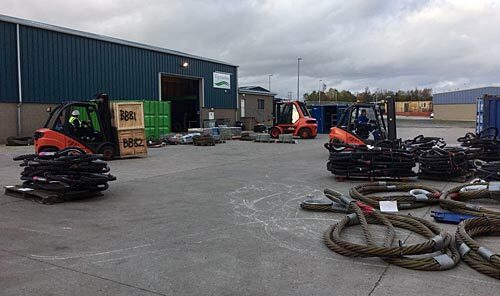 Lifting and marine product specialist Rigmarine has opened its fourth global facility in the rural village of Insch, 30 miles to the northwest of Aberdeen, Scotland. The site, strategically positioned to serve the offshore oil and gas, renewables, construction, break bulk, shipping and marine industries, joins other Rigmarine locations in Baku, Azerbaijan; Aktau, Kazakhstan; and Sharjah, UAE. As part of the Gaylin Group, this is the 10th international hub alongside others in Singapore, Korea, Malaysia, Vietnam, China and Indonesia. Below-the-hook specialist Modulift in addition to force measurement, load monitoring and suspended weighing load cell equipment manufacturer Straightpoint are among those who have committed to supplying the new facility. Rigmarine, meanwhile, will manufacture wire rope slings up to 128 mm diameter. He is candid about the flatness of the offshore oil and gas sector in the region – the industry is cautiously optimistic about the outlook, at best – but believes now is the right time to commit to the sector as offshore clients, particularly those working subsea, are seeking suppliers who can diversify and offer cost reducing initiatives as well as multi-disciplined packages. The site, which will draw from the area’s pool of skilled workers and those seek new challenges, was previously used as an office, fabrication workshop and yard, but it has since been customised by Rigmarine. Duncan explained that the business will be controlled under the Rigmarine Group quality management structure, that he calls one of the most advanced in the lifting industry and has been proven successful at other locations.